The English Channel was churning the morning of June 6, 1944. A storm had delayed the launch of the largest amphibious invasion in the history of warfare. The weather cleared just enough for Gen. Dwight D. Eisenhower, the supreme Allied commander of forces in Europe to declare: "OK, we'll go." And so they did. American, British and Canadian troops sailed across the Channel from southern England and they landed along five beachfronts. They met ferocious resistance. The hardest task fell to the American forces landing at Omaha Beach. They had to scale cliffs and battle German soldiers dug in deeply. The battle would be won eventually by the Americans, Brits and Canadians. They would leave the beach and begin fighting their way toward the German "Fatherland." They left behind huge troves of equipment. NOVA, the science series produced by PBS, looks for those items in an installment to be aired Wednesday at 8 p.m. on Panhandle PBS. 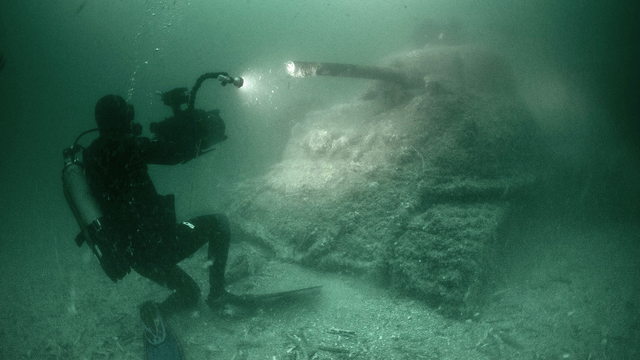 "D-Day's Sunken Secrets" takes viewers under the English Channel to find Allied ships and aircraft sunk during the ferocious battle to retake Europe from the hands of the tyrants. NOVA employed state-of-the-art technology to find these relics. As PBS notes in its online promotional trailer: "Dive teams, submersibles, and underwater robots will discover and identify key examples of Allied craft that fell victim to German shellfire, mines, and torpedoes, using the latest 3D-mapping tools to plot the relics on the sea floor." NOVA also will show us some of the technology the Allies used to defeat the Germans -- and will interview veterans from that terrible battle who will tell their stories of what happened when they became part of arguably history's most decisive battle to end the world's most destructive war. The Nazi tyrant/madman Adolf Hitler didn't expect the Allies to invade at Normandy. He had believed the brunt of the attack would come at Calais. He was mistaken. The Allies hit his forces hard and were able to storm off the beach and begin the liberation of western Europe. This victory, though, came at tremendous cost in terms of human life and in equipment. We've recovered the remains of the men who died that day. The equipment remains sunken under the English Channel. NOVA's "D-Day's Sunken Secrets" gives us a peek at what was left behind.